This is stretching the terms of our mandate a bit but a majority of the Board felt it was important and appropriate to join the chorus of comments protesting the dedication of a prime area on Parliament Hill to a memorial to the victims of communism. Here is our letter. Local heritage architect Barry Padolsky was out of the gate first, with an open letter to the Prime Minister before the winning design was even announced (Sep 1, 2014). and numerous other news articles. To date, in just the Citizen and the Globe and Mail, there have been 19 letters to the editor on this topic, all against the plan. An interesting comparison of sizes of memorials of all kinds (1.9 MB), local and international, by local architect Rick MacEwen reveals that the one proposed for the Hill is way larger than any comparable memorial. + Liberal Party critic of Canadian Heritage Stéphane Dion on Feb 26 came out against the location of the memorial (Ottawa Citizen, Feb 27). An article printed on Feb 27 also disclosed that the designers had slightly reduced the size of one part of the memorial. Available on the web site is a pre-press conference article dated Feb 24. + In response to a question by MP Paul Dewar, the Parliamentary Secretary to the Heritage Minister, Rick Dykstra, denied that there had been no consultation. The article appeared only in print, on Feb 28. + The CBC’s The National on March 1 had a story (2’14”), with clips from Shelley Glover, Toon Dreessen, Paul Dewar, Stéphane Dion and Pierre Poilièvre. + The Canadian Institute of Planners joins the chorus opposing location – Ottawa Citizen, March 5, 2015. + A major article by Don Butler, and several (one, two) additional pieces, spread over four pages in the Ottawa Citizen of March 7. + Joanne Chianello, in the same paper, also chimed in. + March 13 – In an article in today’s Metro that is mostly about Phase 2 of the LRT, Minister Pierre Poilièvre also comments on the memorial and is quoted as saying: “…as for the location, listen, I think that the alternative is yet another government building … I don’t have any of my constituents calling my office and saying that we need to put another government building on that particular spot“. He repeated this claim, apparently at an event in Sandy Hill, as quoted in an article by Jordan Press in the Ottawa Citizen of March 26. As subscribers to the GA List know, that’s a lie! The same quote appears in an article in the Globe & Mail dated 25 March that didn’t make it in print. “It seems a little too facile to memorialize victims of a safely far-away government when our own government seemingly turns its back on Canada’s victims. For example, our Plains Indians were subjected to starvation in the 19th century to open the land to European settlement. More recently, generations of Indian children suffered in the residential school system; many of their children and grandchildren remain victims today as the harm cascades through generations. Today, where is the government’s concern about missing or murdered aboriginal women, about ensuring that all remains are identified – a failure to care that goes all way to the top. + March 26 – Seventeen former presidents of the Canadian Bar Association signed an open letter, “This monument puts justice under a shadow,” published in the Globe & Mail of 26 March. + April 1 – Minister Glover replied to our letter. No new information. + May 2 – CEO Mark Kristmanson’s reply to our letter alluded to the federal design review process. Based on comments by the CEO at the previous day’s NCC Board meeting, an article by Don Butler in the Ottawa Citizen of 23 April confirms that this process could delay construction. The design will come to the Board in either June or September; if the latter it is unlikely that construction will begin this year. An accompanying article on the same page by Butler reveals the specific objections the NCC’s advisory committee expressed between February and August 2014. As well, an attempt by the NCC to have the government announce the site as “intended” did not succeed. A bonus article, again by Butler on the same page tells of an Environics survey of 1500 adults in the NCR last fall. It reveals that many people are unaware of the change in the NCC’s mandate imposed by the government in 2013. For example, 42 percent thought that the NCC was still responsible for Winterlude. + A column by Joanne Chianello in the Ottawa Citizen of May 2 highlights the two faces of MP Pierre Poilièvre, now the Minister responsible for the NCC and our region — supportive of the city when it comes to investments in infrastructure, but stubbornly partisan about, for instance, the memorial to the victims of communism. Says Chianello: “Maybe that sort of hyperbole is par for the course for politics. Maybe he’ll grow out of it?” Let’s hope so. + Don Butler in the Ottawa Citizen of May 7 reports that the NCC’s Advisory Committee on Planning, Design and Realty will consider the memorial’s design at its meeting that week. 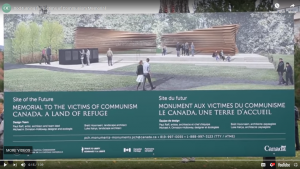 + Nadine Blumer, a post-doctoral fellow at Concordia University, in an op-ed in the Ottawa Citizen of May 9, compares the controversy around this memorial with the silence around the Holocaust Memorial set to be erected on LeBreton Flats. + Defence Minister Jason Kenney is quoted in Metro of May 13 as saying that the memorial is a “suitable” tribute. “I’d rather have a park on that lot, with a monument on the back of it as a public space as opposed to yet another downtown office tower,” echoing Minister Poilièvre’s earlier statement that he didn’t hear a popular desire for a building full of lawyers. + In a May 22 letter to the editor of the Ottawa Citizen, Peter Fedirchuk of Ottawa, whose parents suffered under Stalin, proposes that the memorial be placed in Strathcona Park, facing the Russian Embassy. + Elisabeth Payne, in the Citizen of May 25, reports on a Canada-wide EKOS poll showing that 78% opposed the memorial; 83% in the national capital region. Even 63% of self-identified Conservatives opposed it. A national library and a monument to the injustices against Aboriginal peoples were top choices. Joanne Chianello devoted her column on it on May 26 as well. The full list of questions is on the Citizen’s blog, which has a further link to the EKOS web site for the full report. The poll was based on 2,116 on-line respondents (340 in the NCR), held May 12-19. + On the same page as Chianello’s column, Lee Berthiaume reports that Ministers Jason Kenney and Shelly Glover were standing firm in the face of all this opposition. + On May 27, on a motion by Councillor Nussbaum, seconded by Councillor McKenney, City Council voted 18 to 6 to formally ask the federal government to move the memorial. The Nays were from Councillors Moffatt, Qaqish, Chiarelli, Hubley, Mitic and Darouze. Joanne Chianello’s column on May 28 discussed it. She notes that City Council has full rights to intervene, given that the memorial plans contradict the Long Term Vision and Plan for the Parliamentary and Judicial Precincts that emerged from broad consultation and was updated and approved by the federal government in 2006. + Letters to the editor keep coming (some favouring the monument, most not), including one on May 30 from Mary VanBuskirk in Ottawa which was accompanied by a lovely picture of a chapel in Vidin, Bulgaria, on the Danube riverbank, that is dedicated to the victims of communism. She would “rather have that, than the massive, vulgar monstrosity being proposed”. + September 6 – Conservative MP Royal Galipeau believes there is “wiggle room” in the choice of the site for the monument (Don Butler in the Citizen of June 8). + On June 10, Lyette Fortin, former House of Commons director of architecture strategic planning, and Robert Allsopp, an urban designer who helped prepare the 1987 Long Term Vision and Plan for the parliamentary and judicial precincts, held a joint lecture at City Hall. (Don Butler provided a preview in the Citizen of June 8.) The Council Chambers were filled to capacity. + June 23 – The Citizen reports on an Open Letter to NCC Board Chair Russell Mills from a coalition comprising the Royal Architectural Institute of Canada, the Canadian Institute of Planners, the Ontario Association of Architects, the Canadian Society of Landscape Architects, Canadian Architect, and Heritage Ottawa (Blair Crawford, June 23; Michael Woods, Metro). “The parliamentary and judicial precincts are not a playground for the whim of the moment,” the letter says. “Canadians value their Parliament and their courts.” An Open Letter to all members of the Board followed the next day. + The day before the NCC Board meeting, about 25 people took a stroll down Wellington Street to express their opposition the location of the memorial (reported in Metro). + Also that day it was reported (Tyler Dawson, Citizen) that four members of the NCC Board, whose term of appointment had long expired, were stepping down and five new Board members were appointed. Two stepped down effective the June 25 meeting. (One of those, former Ottawa Mayor Jacquelin Holzman, was said to have stated that her term was to expire in November; she later corrected herself, saying that she was serving at pleasure and could therefore be asked to step down immediately.) See also Bill Curry in the Globe & Mail. + That evening the NCC Board held its annual Public Meeting. Ten people were given an opportunity to ask questions; five were on the memorial controversy. The NCC said a decision on the design would not come before the Fall. + The day after the NCC Board meeting (June 26), the Royal Architectural Institute of Canada, Heritage Ottawa, Barry Padolsky and Shirley Blumberg applied for an injunction to block further work on the memorial (Citizen, Globe & Mail). Here is the court application. They soon received assurance that no ground would be broken for at least two weeks and if it would happen later, they’ll be told so that they can proceed with the injunction application (Citizen, July 3). + CBC’s Day 6 program on July 4 also covered the story: Brent Bambury talks with three Canadians, including Gabor Maté, who have fled communism (12 min). + On July 13 Shannon Gormley opines in the Citizen that the Memorial to Victims of Communism is monumentally ironic because it resembles the style of authoritarian rulers who also love ostentatious and costly monuments and don’t let public opinion get in the way. + Another poll (National Post, July 13) queried Canadians about the Memorial to Communism and the idea of a gigantic Mother Canada statue in Cape Breton (no sample size disclosed, but the margin of error is said to be 1.96% with undisclosed probability). Of those expressing an opinion on the Ottawa case (the report does not say how many did), 77% expressed disapproval, of whom 53% strongly disapproved. + The Citizen reveals on July 14 that the Czech and Latvian governments have donated respectively $20,000 and $14,000 to Tribute to Liberty, giving Minister Poilièvre a chance to gloat. + Finally, what the town has been waiting for: “NCC approval of memorial postponed to after election” (Don Butler, August 7, the Citizen). In an August 5 letter, CEO Mark Kristmanson confirms that the design approval will not be on the agenda of the Board’s September meeting but instead come up in November. + A day later Don Butler reports that the government’s contribution now is expected to be $4.2 million, up from the previously reported $3 million. Tribute to Liberty’s fundraising goal would be halved, to $1.26 million. + On September 18, the Ottawa Citizen’s Don Butler reports that, last August, Hungary quietly contributed $121,000 to the Victims of Communism project. On September 24, a letter to the editor points out that, in 1956, Canada opened its doors to 37,000 Hungarians but that the current Hungarian government is now erecting a razor wire fence to keep refugees out. + A Canadian Press story, distributed widely in late September (including on the front page of Ottawa Metro on September 28) also reveals the objections raised by the NCC’s advisory committee on planning, design and realty. + At an all-candidates meeting in Ottawa-Vanier on October 6, Elisabeth Payne reports, “The largest cheer was reserved for [Maurice] Bélanger’s vow that the victims of communism monument ‘must not be built’ where the Conservative government wants it”. + On November 6, Joanne Chianello reports that new Heritage Minister Mélanie Joly hopes to make “a prompt decision” on the file. + Roy MacGregor profiles Barry Padolsky, “Canada’s Monuments Man wins one for justice,” in the Globe and Mail of November 14. + December 23 – Don Butler provides more detail about the funds available to Tribute to Liberty. Canadian Heritage gave the group $300,000. Its latest CRA filing (2014/15) shows assets of $883,412, including the government money, up from $573,285 a year earlier. Its expenditures were just $54,717, down from $200,000 the year before. The group’s chair said he was not certain whether the money received from the government could be counted towards the revised $1.5 million fundraising objective. + January 20, 2016 – In an op-ed in the Ottawa Citizen, Andrzej Caruk, past member of Friends of Solidarity (Poland) and Black Ribbon Day Society (International), argues that we have a moral duty to commemorate the victims of communism, and not allow communism’s evil to remain hidden and forgotten. That brings you to the survey. You’ll find it biased in that it assumes that the Monument will be built. Only at the very end is there an opportunity to provide open-format comments. + February 11 – Former MP for Ottawa Centre, Paul Dewar, suggests in the Ottawa Citizen that the memorial to communism should be ditched altogether. Instead we should build a National Aboriginal Centre on Victoria Island, as per the late William Commanda’s vision. Six days later, Irene Tomaszewski, herself a victim of communism, takes issue with Dewar calling communism “an idea,” seemingly ignoring what it meant in practice. Still, she is opposed to the memorial, suggesting instead that the funds should be used to establish a centre for the study of totalitarian regimes. “Ditch the communism memorial and educate instead” she concludes. + April 7 – Don Butler in the Ottawa Citizen reports that, back in June 2015, the NCC’s Chair and CEO decided to sever design approval from decontamination of the site. The June Board meeting approved only the latter because the design was “simply not ready.” It was a decision the federal government only reluctantly went along with. Comment: The NCC was not the “headwaiter” some accused it of at the time. + April 23 – Jon Willing in the Ottawa Citizen reports that more than 8,500 people have responded to the call for advice on the Memorial; almost half lived in the national capital region. A few days later, on April 28, the NCC Board of Directors agreed on a new site, adjacent to the Garden of the Provinces and Territories. Next will be approval of urban design guidelines and finally, after completion of a new national design competition, final design approval. Here is the NCC staff report (3MB), including complete results of the survey.